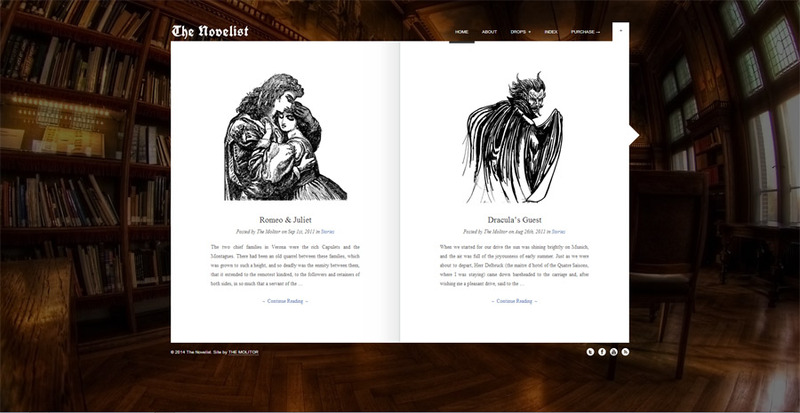 There are a lot of beautiful WordPress themes for writers and authors in the wild. Here’s a (constantly updated) list to help you cut through the chaff. I’m confident you’ll find a theme for your book on this page. Remember, we all want to sell books with our site. So choose a theme that shows off the cover, book excerpts and basic book info. Without distraction. I chose the themes below because they all do this well. Click here to get the theme that I use…DIVI! 1. 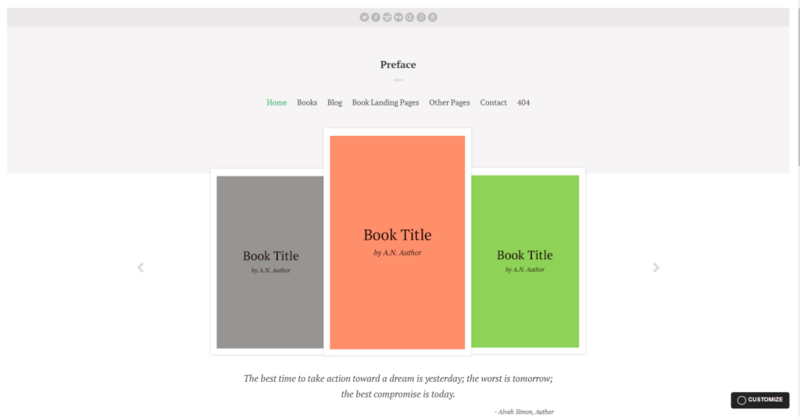 Author Pro Theme ($99, with Genesis Framework) New! 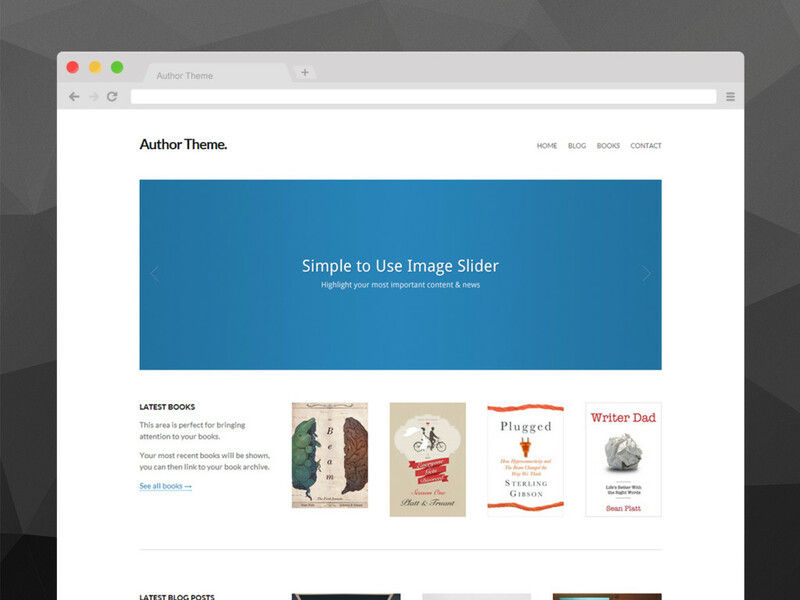 Sometimes it’s easy to recommend a new WordPress theme for writers and authors. You see it and you just know that the designer is also an author and understands the challenges involved with having a good site. The Author Pro Theme is just such a theme. 1) A Landing Page feature that comes in handy when you want a no-distractions page for selling your book. 2) The $100 also includes the Genesis framework, which is a series of WordPress-compatible features like SEO tools and security. You also get personal support. From experience, I can tell you that Studiopress’ hand-holding is the best I’ve ever come across. If you don’t like to spend hours messing with plug-ins and code then the premium price is worth it. Oh, wait a third benefit is the Author Pro plug-in which allows authors to easily add books to their sites. The books can display custom information, such as ISBN, description, price, publisher, and editor. This helps give the site a cohesiveness that any author who wants to sell books directly to the reader will want to have. 3. BEBO Author Landing Page New! This WordPress theme for writers and authors stands out for its slick design and a couple of cool features that you don’t find everywhere. A timer widget. This lets you run a timed promotion on your site. These are available as a plug-in for your WordPress site, but it’s cool that the feature is built in. Three styles. All of them are nice looking too. Other features include mobile-friendly design, video and an attractive master slider that will give you a chance to highlight your book cover. 4. Parallax Pro ($100) New! Parallax sites are those sites where scrolling down adds nifty animations like sliding, fades, color changes, etc. It’s a cool trick and people still go nuts for a good Parallax site. The best one I’ve seen as far as simplicity and extension is Parallax Pro. It’s on the pricier side, but the hundred bucks includes the Genesis Framework, which allows for easier updating and editing when it’s time to make changes to the site. Highlighted features (in addition to the Gensis Framework) are Landing Pages (necessary for your books and for promotions like newsletter sign-ups), HTML 5 markup and fully mobile-friendly. 5. X | The Theme ($63) New! X | The Theme is a catch-all kind of theme, promising a full suite of tools for everyone. This is especially true when you consider the fact that X is actually a suite of themes, not just one. Yup, the developer has crafted a single package with multiple designs, one of which will likely fit your needs. X also comes with a suite of free tools (like Mailchimp integration). This saves time and heartache caused by third-party plug-ins. If simplicity and focus is your thing (and it should be) then you’ll need to consider this WordPress theme for writers and authors. The layout is simple, the slider is an unbloated, straight-forward thing and the product pages have almost everything you need. The one missing feature is a way to read a sample. One of the details that set this theme apart is the parallax design. “Parallax” is the style that you see on some sites where the background image scrolls at a different speed than the image in the foreground. It’s a fun effect that can be used to guide the customer through your content. I read through the comments by users. There have been several bugs that have taken a while to fix. Bugs are common, but watch the discussion to see if the response time improves. Devs must support their themes, no matter how noisy (and annoying) customers get! If the outstanding bugs don’t appear to impact your goals, then consider the Bookish theme. This theme is for those of you who lean heavily on excerpts to sell books. There aren’t a lot of page types (like in the Preface theme above) but it is a theme that lets you hone in on the work you do. Stumbling on a site that looks like an open book immediately tells the reader that they’re in the right place. Among the features that the theme touts (beyond the bookish design) are Responsive design (to look good on mobile devices), support for the beautiful Google Fonts library and customized backdrops. The theme has great ratings and folks seem happy with the FREE support. Fixed-width, for when you don’t want tech messing with your content. Why could this theme steal my business away from Cleanspace? It’s good looking, expandable, updated often, and it’s made by the Copyblogger folks who simply make excellent products with fast support. As I add more book series to my roster I’m positive that my website needs will change. If they do, I have my eyes on Minimum Pro. I used this theme for years. It does a number of things well. First, it looks great out of the box. I’d have to work really hard to make it ugly. And, believe me, I’ve tried. Second, it includes a number of visual features that I like, including a huge slider that displays large images across the width of my site. The sliding animations that I’ve made with the tool are incredible. You can check out the slider on my homepage (note that I do turn it off sometimes, so I can’t promise it’ll be there). Third, I chose my theme because it’s a premium theme. I want the support that comes with premium purchases. I’m not too happy with the help I’ve received from the developer, but the community is helpful. I’ve run with Cleanspace for several months without a hitch. Fingers crossed, but I think I chose a winner. If you’re looking for a WordPress theme for writers and authors that presents your content elegantly, check out Rain. It’s perfect for a site that is just for one book. You can upload an image of your choice and it appears fogged on the left side of the screen. You could put an image on the site that hints at a place or event in your story. Cool! The writing is presented in a simple, clean way (with Google Font support) and scrolling up/down from one page to another is lovely. I could do without the ability to play an ambient audio file, but to each his own. The site owner can turn the audio off. Designed and built by Elite developer. The boards have happy people and a load of comments by the creator. Table of Contents screen allows you to string together your content in a way that’s familiar to readers. Beware of one thing. Widgets are not supported, which makes sense. You wouldn’t want to soil the sweet design with widgets, right? Responsive design (meaning it will look good on mobile devices). Best is a simple theme, with a simple blog-like layout. It would work nicely for writers who plan to do more blogging than selling. If selling is important to you, though, you can skip to the next one. 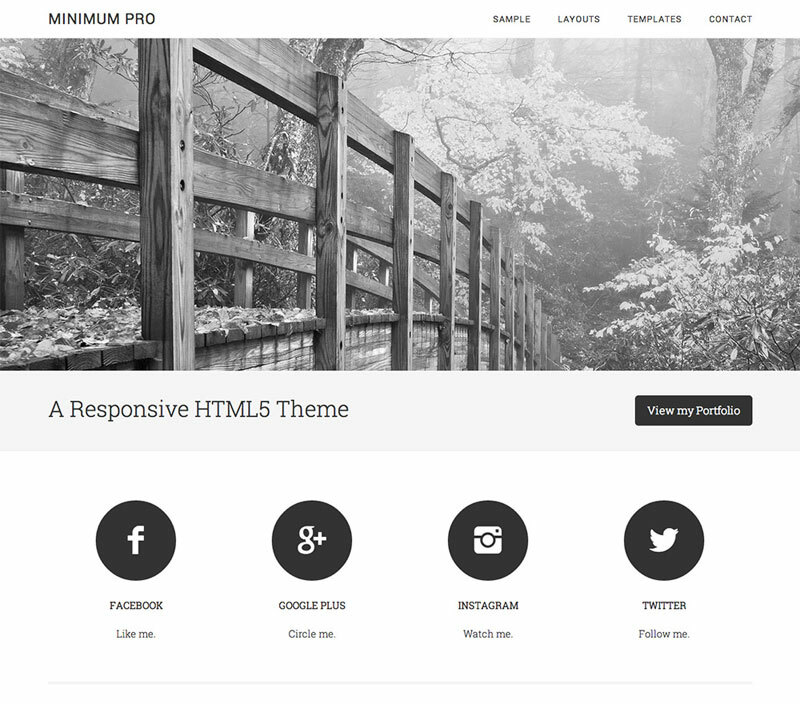 This is one of those solid themes that just look professional. Its features are pretty impressive, too. 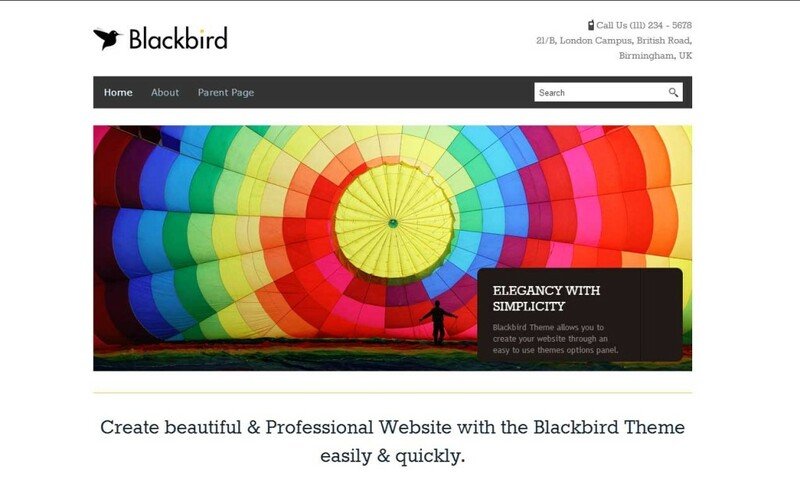 10 Different Color Skins, WordPress Themes to get Site Ready in 1 Click. Individual Page/Post Customization – Change various layout options on each individual page (or globally if you want). I used this theme for about six months and was very happy with it. I somehow corrupted the site install one fateful evening, which made me look around for new themes. That’s when I ran into Cleanspace and we fell in love. 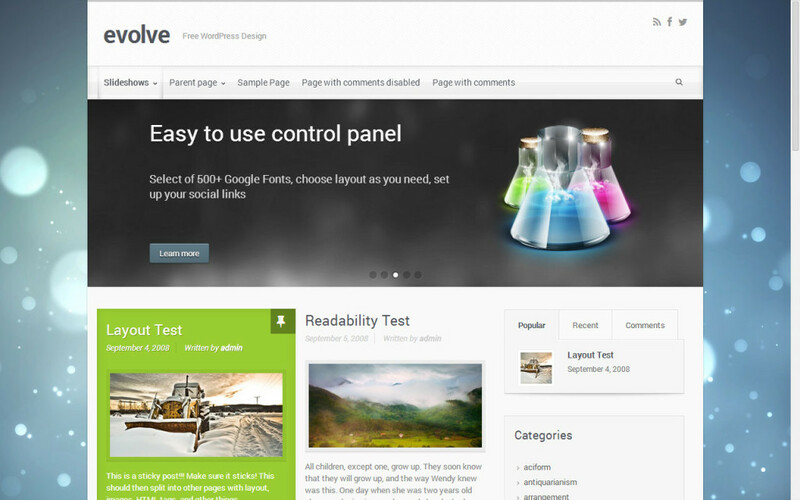 But Evolve is a very competent free theme that I recommend to anyone who’s building an author site. Single blog post or blog grid layouts on the home page. Over 500 Google Web Fonts. That last feature is a beauty. Google web fonts allow you to play around with type design on your site, which can be important to standing out in a crowded field and getting the important points across. Make sure you get a second opinion on how the site looks before you play around with fonts too much. It’s easy to get carried away and make your page look blechy. This theme is similar to my own in that it offers a wide slider at the top that can dominate the screen. I like that look because it lets me highlight what I want without having to think too hard. All I have to do is upload an image, make a call to action and I KNOW that everyone will see it, because they literally cannot miss it. 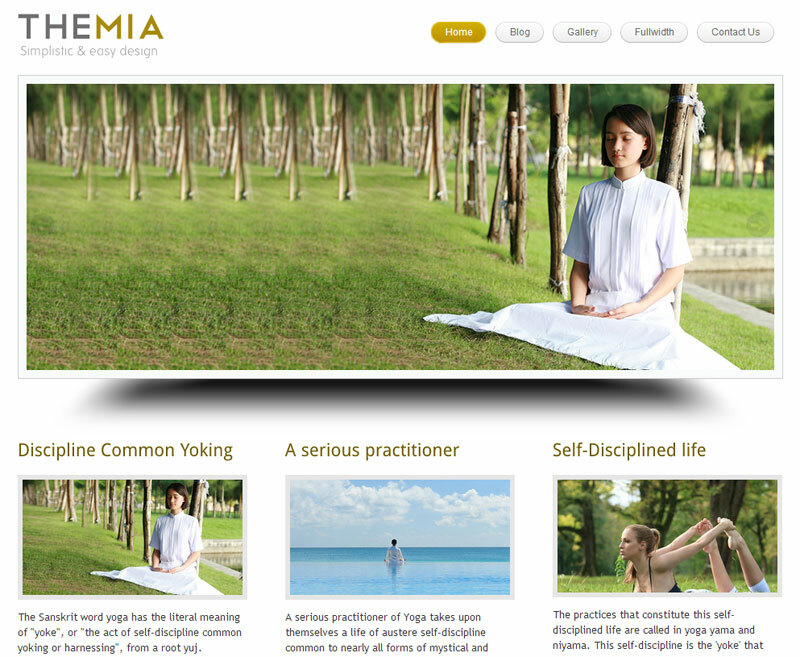 I also like Themia for its full width/product pages and easy-to-read buttons. 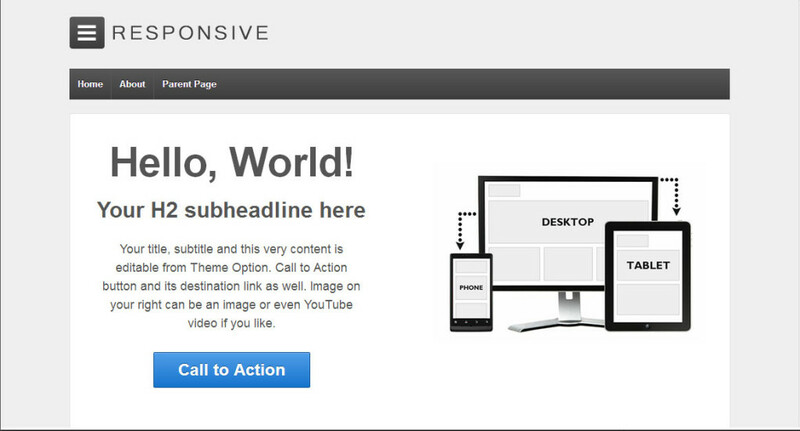 Responsive is another simple, free theme that I used for several months. It has a good rep for support even though it’s free. Nothing is more valuable to someone just starting out, with limited time to futz around with webbie doohickeys. Adapts your website to mobile devices and the desktop or any other viewing environment. 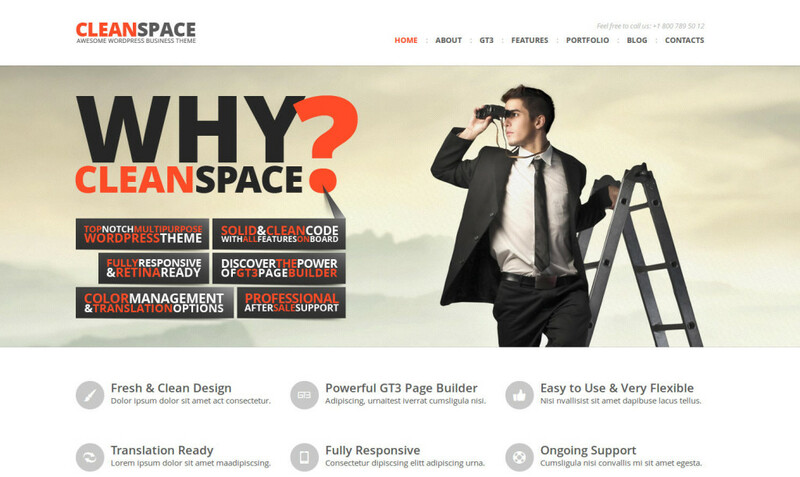 9 Page Templates, 11 Widget Areas, 6 Template Layout. Easy Logo Upload, Social Networking and Webmaster Tools (we’ll discuss this in the plug-ins post later). Responsive is WooCommerce Compatible (important if you want to sell books directly, we’ll also discuss this in the plug-ins post). I’ll add more info to this page as I test more themes. NOTE: Some links are affiliate links. The themes I’ve tried before are noted and highly recommended. The rest of the themes look fantastic and have shining support according to the theme comments. Thanks for reading, Paul! That’s good to know. WooCommerce is on my to-do list. I’m interested in finding ways to sell my book directly, but I’m only in research mode. I’ve had a lot of luck selling locally! But I’m not sure how to sell directly online without harming my exposure on Amazon, Kobo and the Apple Store, all of which give me steady sales. Nice post – just found it! I’d add Alyeska ($45) and The Novellist ($55) and U-Build ($55) – all from Themeforest. I’ll check these out tomorrow. Thanks for the heads-up Bill! Really a nice work..it will really a helpful one. I just created a blog to help the students with their school or college life and writing works. Thanks so much for reading! I’m working on the plug-ins post now. This is a great list, Ben … Minimum Pro looks very nice. I just released a WordPress theme for writers and authors myself called WP Writer’s Block. It concentrates on simple, responsive layout that uses post formats to display different types of content – regular posts, status updates, quotes, and links to other sites for portfolio items. It’s less concentrated on images and more on great typography and ease-of-use. That’s a beauty, Josh! I’ll include it in this list when I do an update. I also like your site. You talk about a lot of the things I’m into. I’ll be teaching a course at School of Visual Arts next year on Digital Identity. I’m fascinated by the process of establishing a strong presence online during our creative lives, and after we die. Morbid, perhaps, but it’s worth pondering as we pass our IDs into the digital ether and cross our fingers that it will outlive us. Hey, Ben, great post! 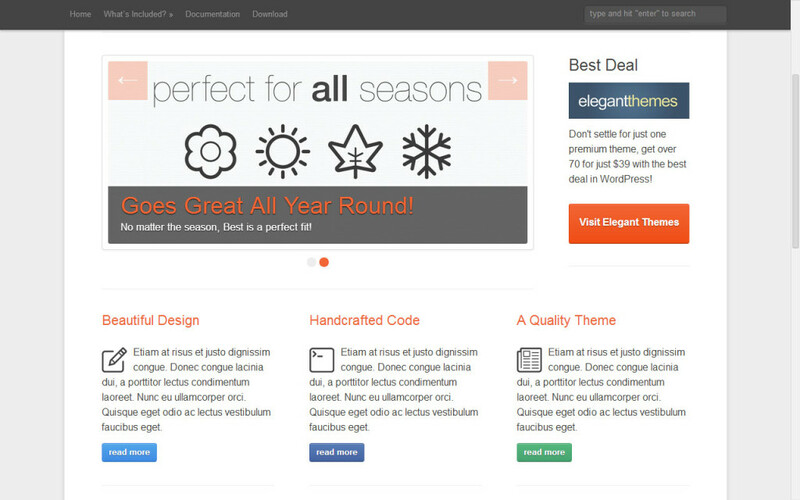 I’ve been using themes from elegantthemes.com. Lots of themes to choose with updates from for an annual fee. I’m using the Minimal theme at the moment, but I’m looking to switch to a new one. Any thoughts on easy ways to creative logos/nicely designed names for the top of a site, for instance your name at the top of this post? Thanks Michael! Wow, I remember you signing up with elegant themes years ago! Do they allow you to use the themes for every site you own? I’m not very happy with Envato right now. I followed the link to purchase the CleanSpace Theme, paid for it, downloaded it and the .zip file is missing the stylesheet and will NOT upload. I emailed Envato Customer Support with NO reply back 24 hours later. I called International to their office in Melbourne, Australia, and left a voicemail. NO reply. I contacted GT3 Themes by phone and their number is a vacation survey. I emailed their support desk and NO response. So, I have spent $55 +$2 PayPal charge for a download that does NOT work because it is missing files. Anyone that knows how I can contact these people to get a valid file would be greatly appreciated!!! Hey Joe. Man, what a pain! I’ll see if I can dig up the zipped theme. After about 15 different downloads I was finally able to get a .zip file that was complete. Working on site now. Great! I found my site file. Good luck to you. It’s a good theme once it’s up and running! Thanks Amigo…I appreciate you looking for a file. Getting ready to start blogging the novel before Fall Publication Date…so I need to be it up and running within the next week to 10 days. It’s what I was looking for, so that I can have a Gallery of Photos and Artwork relevant to the novel, as well as a Chapter List with about 50-60% of the novel released for free online until publication. So, thanks for posting about and recommending this theme, along with the others. That sounds like a solid plan. Good luck to you on your book launch. Love your list of themes. I liked the Webbie design and was seriously contemplating that one but It doesn’t look like there’s some kind of interface or something that will allow you to use capture the email addresses into your list at the point of sale using their system for free downloads. That feels like a deal breaker to me right now. At this point, I want to build a list and accumulate sales. Thanks for these options. Wow, that’s an excellent point! I wonder if there’s a plug in you could leverage for that. Or you could hand off the transaction to a service like Gumroad. I’d like to able to offer a couple of free chapters when people enter their email address. Are there any plugins that support that?